tourism. In resent years, an effort has been made to develop tourism beyond the all-inclusives at Playa Blanca and Puerto Del Carmen for independent travelers. Lanzarote is beautiful! The scenery is stunning and there are so many great things to see. It would be a crime to go there just to sunbathe and stay in a resort. Get out there and see the stunning coastline and voocanic features. The eastern most Canary Island Lanzarote has a desert climate and is known for its year-round warm weather, beaches and volcanic landscape. Interesting place to visit with this varied landscape. When it comes to island vibes, romantic dinners, and amazing scenery, Lanzarote delivers! My now husband and I decided to take a trip of a lifetime and travel to a place with the "we probably will never get a chance to go back!" mentality in our minds and take our honeymoon in Southern Spain and Lanzarote. Lanzarote did not disappoint! With its black rocks, splashing blue-green water and stucco white buildings, Lanzarote is a minilimistic, environmentalists haven. The entire island is sustainably managed due to the hard temperament of the soil, and it is covered with black, hard volcanic rock. It gives the island a very rough, earthy feeling. I love everything earthy and although I am used to the plush green forests of Santa Cruz Cali, the stark difference of this landscape was stunning. We stayed at the Royal Princsesa Yaiza Resort in Playa Blanca right next to the beach and it was magnificent and by far the best resort I have ever been. It is highly recommended with a very decent price tag! Much like many island cities, you can enjoy a very long strip of restaurants and stores along the coast. My husband and I stayed closer to the coast near this strip for most of our stay because it was absolutely beautiful to eat right next to the sea! You can also go inland where buildings become a little more sparse and you enter farm country, which is equally beautiful in its very agricultural way. :) It was so interesting learning about their farming techniques because of their very different terrain. I am huge into nutrition so when we visited the Aloe Lanzarote Museum, I was highly intrigues to find out that most residents eat aloe everyday! I already plan on growing my own aloe plant! Think Hawaii but without any of the trees? Huh? Ok think Mars. Ok no not quite either. Lanzarote is an oasis - a floating rock formation off the coast of Africa. It feels like somewhere you've never been before. Who goes there? Well, technically this is Spain but Lanzarote has an even more laid back vibe than any where in Spain. Here they make fun of the uptight Spaniards. This is an eye popping, instagram ready, rocky island with some amazing sandy beaches and turquoise blue ocean ready for a swim. It's a well known vacation spot for many Germans and northern Europeans. For you, this may be a trip you'll brag about to friends back home. Rent a car, rent a house or hotel, and be sure to drive to the north and south of the island for the best beaches! Last June I went to Lanzarote for a week long holiday and it was a fantastic trip. We went to Timanfaya National Park, Jameos del Agua, Cueva de los Verdes, El Golfo (where I ate an excellent grilled fish). The highlight of the island is its good climate, weather had been fine and well. The first 2 days were very windy (as a local, I can say it is rare that time in June) but rest of the week was fine, besides, once on the island I also discovered a mobile app, Lanzarote ON for a complete weather guide of Lanzarote. Power ON, the Radio station (great music) was talking about LanzaroteOn, I downloaded the app which helped us with the weather and point of interests on the island, all in one place, wish the app was there when I had planned my trip using the internet. 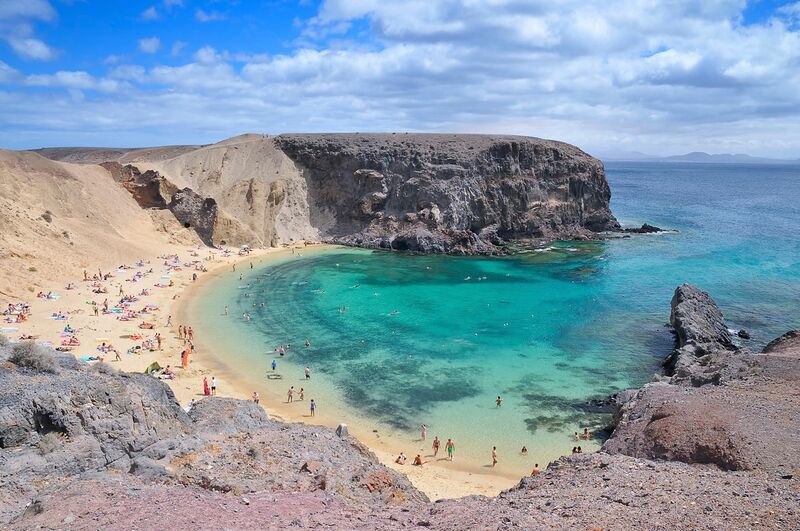 LanzaroteOn had also listed unique places such as natural pools in Playa Blanca Los Charcones, I recommend at least one visit for its beautiful views). Even after we got home, we realized that this app also had discounts on various entertainment places like restaurants, bars and clubs. Wish I could have taken those discounts if I had seen them when I was on the island, could have saved a lot of bucks hahaha. Well folks on your next Lanzarote vacation, my advice is that you download this app at (www.lanzaroteon.com) and hopefully make more use of the app. Have a good trip friends!! Just about to go to Lanzarote for the fourth time. Peurto del carmen is the place that I have stayed the most. Arecife airport is only 20 mins away so all round a good destination. Lanzarote is a beautiful country which is know as the land of fire as most of the island is made up of volcanoes and most of the surface is rocky. It's a tourist place mainly filled with Europeans looking for fun in the sun or for a relaxing get away. The island of Lanzarote is a hidden gem of the Atlantic, a place of great wonder, beauty, and inspiration, from the volcanic landscape to the eccentric outsiders that flock to its energy. Many, like me, are initially drawn in by the lure of a tiny island with good weather, pretty beaches, and outdoor excursions. But shortly after arriving it is clear that this is not your typical tropical vacation. The volcanic landscape and clear blue water meld together in a perfect harmony that is absolutely awe inspiring.